Before Arrow premieres, I thought it would be fun to get to know the cast and their past roles, so stay tuned for weekly posts. Today’s entry in the “Where Do I Know You From?” files is Willa Holland. In a time when rambunctious teenage characters fill television shows, Willa Holland’s versions stand out. She rises above the conventional model to create likeable and multilayered characters. Here is a (spoiler-filled) overview of two of the notable roles you may have seen her in before we get to know her as Thea Queen on Arrow. During her school’s mid-winter break, Kaitlin, now fourteen, returns home. We soon find out that she is hiding something when a kid named Justin arrives and accuses her of stealing his brother’s money. After lying about it twice, Kaitlin finally reveals that she stole the money to fund her trip home to make sure her mom (Julie) and Marissa were doing okay living in a trailer park. Upset that she is always in her older sister’s shadow, Kaitlin bonds with Johnny to make Marissa jealous and force Marissa to trust her instincts and love for him. Kaitlin blames herself for Johnny’s death, being with him at the time and unable to save him, and immediately leaves for school. Briefly thereafter, Kaitlin successfully enlists Marissa’s help with clearing her name from a school debacle that she had no part in. Kaitlin returns for Marissa’s graduation and decides to stay for good. After Marissa’s death, the Cooper family struggles, leading the two to make a wager that Julie will avoid guys and Kaitlin will avoid trouble; neither live up to it. Kaitlin blows off an assignment, so her teacher makes Will, a band geek, tutor her. He stands up to Kaitlin, making her respect him. They briefly date, but Kaitlin realizes that she is changing him and breaks it off. Julie grows close to a businessman named Bullit, whom Kaitlin bonds with and wants as her stepfather. While Bullit is away, Kaitlin sabotages Julie’s new relationship with Frank. Taylor and Ryan start a “Team Frank” versus “Team Bullit” war with Kaitlin. Six months later, a pregnant Julie chooses not to marry Frank or Bullit, but to focus on Kaitlin as her family. Kaitlin, who originally appears as a stereotypical uncontrollable and careless girl, transforms into an understanding and loving daughter. Her “bad girl” activities stem from the feeling of being abandoned by her family and uncertainty of their love for her. As morbid as it sounds, Kaitlin could never gain her mother’s attention with Marissa around, so once Marissa passes away, Kaitlin has the opportunity to build a bond with her mom. While Kaitlin retains her sass and stubbornness, she learns to respect and support her mother’s decisions. Willa Holland does an excellent job portraying a dynamic character. She is truly believable as both the wild party girl and the milder young adult. Additionally, Willa comes off with such admirable strength and enthusiasm as an actress. I started out fairly uninterested in the character, thinking she wouldn’t be anything new, but she drew me in and by the end, I loved the journey. Agnes is a model that Jenny first meets while working for Eleanor Waldorf. When Jenny goes out for drinks with Agnes and an older photographer, Agnes compliments Jenny’s designs, thus birthing their partnership. Under Agnes’ influence, Jenny quits working for Eleanor to prevent being further under-appreciated. Agnes suggests putting on a guerilla fashion show at a society party. It goes exceptionally well, although Jenny’s father is furious, causing her to move in with Agnes. Jenny and Agnes take a meeting with a business manager; Agnes attempts to take all the credit, much to Jenny’s dismay. The next morning, Jenny steals Agnes’ phone and arranges a solo meeting with the same manager. Agnes, outraged when she finds out, burns all of Jenny’s dresses and kicks her out of the apartment. A year later, Agnes returns, claiming she is ninety days sober. Eleanor rehires both her and Jenny. They half-heartedly apologize, but Agnes hatches a plan for revenge. Agnes steals the pills that Jenny was planning to return to her ex-boyfriend, Damien, distributes some to the models, spikes Jenny’s Champaign, and drops her off at a bachelor party. Ultimately, Agnes’ scheme fails as Nate rescues Jenny and Eleanor offers Jenny a permanent job. Agnes is a rebellious teenager focused on having a good time. She is bossy and conceited, feisty and joyous. Agnes lives by her own rules, with number one being that she is the center of attention and the world should spoon-feed her because she is a model. Although she may seem completely childish, she does possess the shrewdness and drive of an adult. Agnes compromises what is right to get vengeance for Jenny betraying her and ruining her career. The most fitting word to describe Willa Holland in this role is FUN. Her lively personality spices things up on the show. No matter how Agnes is acting, whether friendly, wild, or vengeful, you are always captivated. The moment when Agnes yells, “Yes I’m insane, Jenny,” stands out as her most shining moment. Willa portrays a haunting concoction of frustration and scheming with anger and the pain of betrayal. See Willa Holland next as Thea Queen in Arrow – Wednesday, October 10 on The CW! 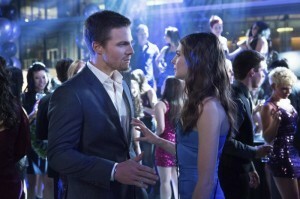 If you missed last week’s file on Stephen Amell, check it out here.